A 2-megawatt solar array on the RIT campus is scheduled to begin operation once certification testing is completed later this month. 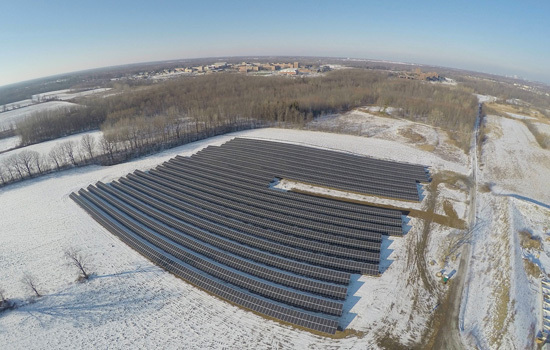 Six-and-a-half acres of a farm field on the Rochester Institute of Technology campus has been transformed this winter into a massive solar array, which is scheduled to be operational early next month. Since December, crews have been working to install a 2-megawatt (MW) solar energy farm, consisting of 6,138 photovoltaic (PV) panels used to generate electricity from the sun. Construction took place on a brisk schedule, during sometimes-arctic conditions. The size of the array is among the largest of any college in New York state. The system’s output, which will generate enough electricity to power the equivalent of more than 200 homes a year, will be tied directly into RIT’s central substation for distribution across circuits throughout the 1,300-acre university campus. Currently, RIT’s main campus consumption is approximately 72 million kilowatt-hours (kWh) annually, according to Garland. The new solar array is expected to produce, on average, 2.3 million kWh per year—or 3.2 percent of the campus’ total. RIT is collaborating on the project with Solar Liberty out of Buffalo, N.Y. Gov. Andrew Cuomo announced in July 2013 the award of $54 million under his NY-Sun initiative for 79 large-scale solar energy projects across the state. The New York State Energy Research and Development Authority (NYSERDA) administers the program, which provides incentives for PV systems larger than 50 kilowatts. RIT submitted an application to NYSERDA to obtain partial funding for the project, with the balance of the cost provided by Sun Edison out of California. Solar Liberty installed and is maintaining the system at no cost to RIT. In exchange, RIT has agreed to buy the solar power produced by the system at a mutually agreed upon rate for a period of 20 years as part of what is known as a power purchase agreement. Destler signed the American College and University Presidents’ Climate Commitment six years ago. The commitment is a pledge by academic leaders to move their campuses toward more sustainable programs and practices. As a result, RIT has begun inventorying its greenhouse gas emissions and has set 2030 as its target for carbon neutrality. “Ultimately we hope this is the start of other solar installation projects to come,” said Enid Cardinal, senior sustainability advisor to the president, noting that with the solar array’s installation RIT’s “green” power increases from 15 to 18 percent. The new array farm marks RIT’s sixth solar project on campus. The Golisano Institute for Sustainability has two arrays totaling 40.6 kW, and the University Services Center has a 12.40 kW system. Liberty Hill uses a 10.3 kW array to offset some of the presidential residence’s electrical power. In addition to a small 2 kW array in the College of Applied Science and Technology, a new 16.6 kW array under installation at the College of Health Sciences and Technology also is scheduled to become operational in April. The new solar energy farm also will have educational benefits. Having access to the energy output performance data of such a large system will enable classes in engineering and sustainability to examine the business case for solar energy as well as what it means for RIT’s carbon footprint. “We’ve yet to see solar’s full promise since we are still waiting to see where it will take us, but its current trajectory is very high,” Hittinger said. Cardinal noted the new solar energy farm is one of a growing number of university-wide initiatives that include waste reduction—namely food composting, reusable to-go containers, food recovery and efforts to make the Gene Polisseni Center a zero-waste facility along with new energy-efficient buildings that will provide energy savings for decades to come and campus lighting upgrades—that are making RIT even more sustainable. For more on the new solar array, go to http://bit.ly/RITSolarArray.